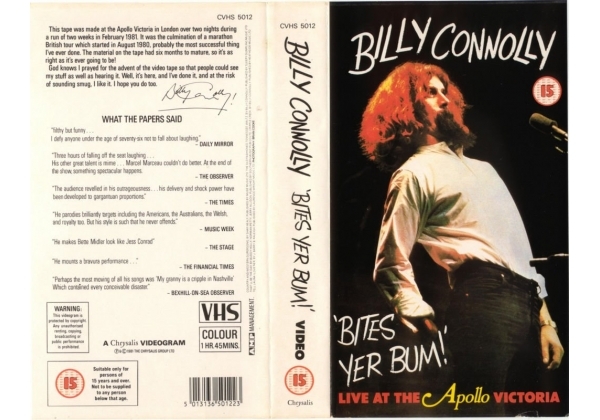 Billy Connolly - Bites Yer Bum! This tape was made at the Apollo Victoria in London over two nights during a run of two weeks in February 1981. I was the culmination of a marathon British tour which started in August 1980, probably the most successful thing I've ever done. The material on the tape had six months to mature, so it's as right as it's ever going to be! God knows I prayed for the advent of the video tape so that people could see my stuff as well as hearing it. Well, it's here, and I've done it, and at the risk of sounding smug, I like it. I hope you do too. Or find "Billy Connolly - Bites Yer Bum!" on VHS and DVD / BluRay at Amazon.